We still have stray bits of Blinding Light!! 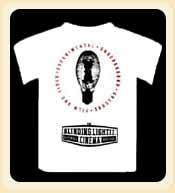 Cinema merchandise available, so feel free to get in touch and we can work something out! Email us with a list of the merchandise you are interested in, and we will let you know what we have left and take it from there. Launched in 2000, this rare series of 4 zines was intended as a tangent to the BL activities - words, images and ideas strung together and hung loose - an amalgam of tales, reviews, art, illustration and insight all spun out of tenuous and tight connections to the Blinding Light. Each edition has a distinct colour with reversed back, and issues run from 30 to 36 pages (see photo). Single issues are $5 including postage (US or CAN), while the set of four with custom filmstrip ribbon will set you back $15 including postage (ie buy 3 get one free). Please contact us before sending in your order to verify availability! The Blinding Light!! 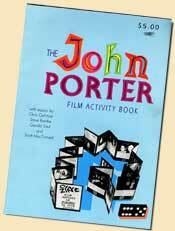 Cinema's extremely rare first-ever zine dating from 1998, this giant tome devoted an entire and full page to virtually every single filmmaker who showed work in our first year of existence. 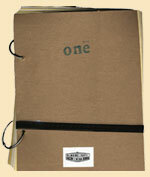 With yellow and white alternating interior card stock pages, a natural brown cardboard front and back, giant ring binding, hand-stamped "one", logo sticker and wrap-a-round custom filmstrip featured on every issue, each hand numbered and signed by Alex. We are entirely out of our original design, but the "RIP" design (identical to the original but with the added 1998-2003) is still available in white (XL only) and in small numbers. $20 including postage (US or CAN).